^ "Topps will buy WizKids in cash deal". Community.seattletimes.nwsource.com. 2003-06-24. Retrieved 2013-07-25. 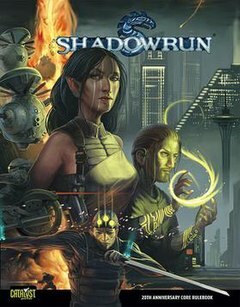 ^ "Shadowrun at Catalyst Game Labs". Catalystgamelabs.com. Retrieved 2013-07-25. ^ Maleficent Rea (2013-07-26). "Shadowrun Returns needs to curtail its nostalgia (review)". Venturebeat.com. Retrieved 2014-03-19. ^ "William Gibson". Williamgibsonblog.blogspot.com. Retrieved 2014-03-19. ^ "The peak (19/10/1998) arts: Cyberpunk on screen – William Gibson speaks". Web.archive.org. Archived from the original on 2007-06-27. Retrieved 2013-07-25. ^ "UK | Northern Ireland | Elf defence for 'lingerie thief'". BBC News. 2007-03-06. Retrieved 2013-07-25. ^ "Magical elf jailed for lifting women's knickers". The Register. 22 May 2007. Retrieved 2013-08-25. ^ "Catalystgamelabs.com". Catalystgamelabs.com. 2008-06-27. Retrieved 2013-07-25. ^ "Shadowrun Online renamed to Shadowrun Chronicles: Boston Lockdown". Nordic Games. March 3, 2015. Retrieved July 12, 2015. ^ Long, Steve (2007). "Shadowrun". In Lowder, James. Hobby Games: The 100 Best. Green Ronin Publishing. pp. 273–275. ISBN 978-1-932442-96-0. ^ "2010 Ennies Awards Noms and Winners". Ennie-awards.com. Retrieved 2013-07-25.